From retro doors to innovative houses.. The project is designed to underline the aestatics of the traditional Cypriot Architecture with the most beautiful items: arches, pergolas, courtyards, quadrangles, pattern mosaic tiles and, of course, beautiful Cypriot doors. 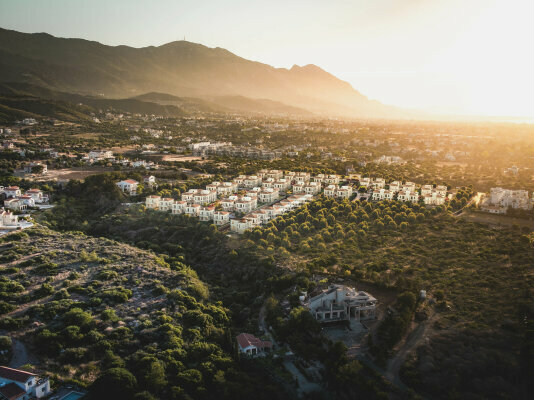 Here you are offered a unique life style from its privileged location to the view of the valley meeting the sea, forming a natural piece of art every day. Live the innovative way of Cypriot life. The project consists of 151 housing options in 32 blocks and 5 different types. A range of one bedroom to four bedroom houses. Each house is positioned to overlook the mountains and the sea. The project is going to be the first sustainable project in Cyprus with international BREEAM certificate. 100% accessible for the disabled, environmental and nature friendly.